A while back, a client came to me with a pretty spectacular “problem”. She’d just closed a 5-figure deal with an Ideal Client, and was on a clear trajectory toward bringing in more money than ever before. In the same conversation, Lori mentioned she’d actually made two $15,000 sales at the same time, but that the first one had been reversed, which she took in stride. Still, her concern was that she was too focused on all the other tasks at hand to allow herself to get pumped up about all the awesome things she had coming in, specifically this one huge check. Although she’d mentioned losing that first $15,000 sale as almost an aside, it gave me some significant insight into where she was with her business, and her mindset. What I have found is that the amount of agony we have over “losing a sale” is in inverse proportion to the amount we celebrate when we close a deal. And to me, there is too much attachment to both of those things. When I am devastated that somebody refunds and I’m overjoyed when I make a sale, I feel like money has too much power over me. It’s as if I’m viewing the money or my clients as my source, and not God or the Universe, which is the true wellspring. As amazing as it is to make those big sales, at what ever level a “big sale” is to you, it’s important to not give it too much power. Not only does it help you bounce back when things fall through (as they inevitably will), but it gets you to a much more peaceful space than the one where you vacillate between exuberance and devastation based on external things. Lori saw the fact that she wasn’t experiencing a spike in her emotions around her $15,000 sale as a bad sign that she wasn’t really resonating with her success, but I took it (as well as her reaction to the sale that had fallen through) as an indication that she had achieved this level of resilience where she could take the good and the bad as they came, knowing that ultimately it was all for the best. And that, my friend, is the sweet spot. 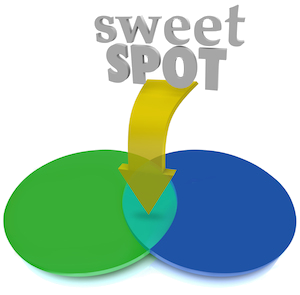 Are you ready to find your Marketing Strategy Sweet Spot™ so you can connect with your Ideal Clients? 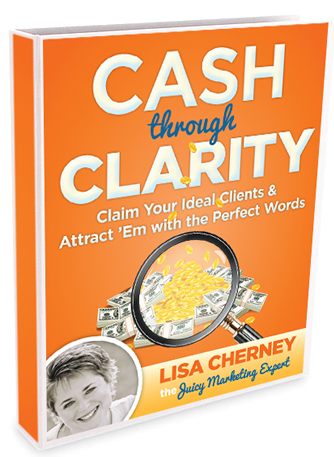 Check out our popular Cash Through Clarity Training & Coaching Program and be sure to take advantage of our free bonus, “The Packaging Your Genius Formula” video training–a $2000 value! Learn more at www.CashThroughClarity.com. Categories: Conscious Business, conscious living, entrepreneursBookmark the permalink.